The Collinsville City Commission will meet Monday Jan. 19th (at the City Hall Community Room, 106 N 12th Street) for a 6pm Work session & 7pm regular Municipal Authority & City Commission meetings. MonDAY, JANUARY 19, 2009 AT 6:00 P.M.
3. Discussion regarding Sales Tax Projects. No official action ... just discussion on what the proposed sales tax would be spent on and when the final list of projects would be finalized. A 5-member park board has been proposed and is expected to be named by the next city commission meeting. The date for the citizens to vote on the sales tax is April 7th. A. Approval of Claims in the amount of $25,011.06. B. Approval of January # 1 Payroll in the amount of $35,555.08. C. Approval of Minutes of the December 9, 2008 Work Session; December 15, 2008 Regular Meeting and January 5, 2009 Regular Meeting. D. Approval of Cemetery deeds: Glen G. Risley, 7 spaces; Charles or Debra Dougherty, 3 spaces: Paul C. Hollon, 2 spaces. 6. 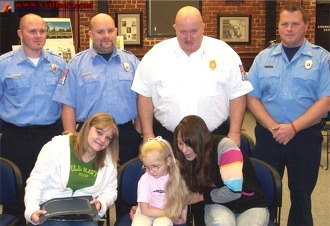 Presentation of 911 Hero Award. 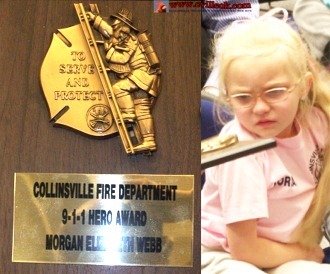 -- (see photos of Collinsville Fire Department presentation to Morgan Webb above). 7. Update from Rickey Hayes with Retail Attractions. -- Hayes indicated 908 national retailers had been contacted on behalf of Collinsville. About 20 of those replied with a possible interest in locating in Collinsville. 4 of those are actively being worked. Hayes inticated future retailer contacts would be more specific to Collinsville particular market strengths. The current economic downturn makes near-term locations here unlikely but expect retail expansions to begin again by 2010 or 2011 nationally. He also indicated the new City of Collinsville web site is getting closer to going online with the city choice of a new logo as one of the open items. 8. Update from Downtown Inc.-- CDI president Brad Francis and treasurer/acting program manager Mary Risley reported financial and operating results from the past few months. Francis indicated information to make citizens more aware of what is happening with Downtown Inc & the city's appearance districts would be made available to the media soon. A. Approval of Claims in the amount of $208,247.49. B. Approval of January # 1 Payroll in the amount of $22,107.32. C. Approval of Minutes of the December 15, 2008 Regular Meeting and January 5, 2009 Regular Meeting. 5. Discussion, consideration and possible action of the Engineering Report for the Wastewater Treatment Plant disinfection Facility and authorize Holloway, Updike and Bellen to proceed with the final design. -- a required discharge test has resulted in yet another DEQ consent order which will require the city to do additional disinfectant to wastewater before being released into the public waterways. A UV light system (for ~$670K) was selected by the city (over a $715K liquic bleach system). The engineer firm will submit a report to the DEQ for approval and the city will try to determine how to fund the new expense. POSTED BY: Angela Long -- DATE: 1/16/09 -- TIME: 3:00 p.m.